Let your little one enjoy a radiating, hot ride of the Lego 8402 city traffic car. Gear-up and set out as the weather is just so perfect for this Lego open-top car, which leaves you with ultimate driving experience. Measuring just 4 inches x 2 inches, this Lego 68-pieces sports car assures ease of portability. This Lego open-top car comes with a minifigure and a tree, which adds to your journey excitement. This Lego 68-pieces sports car allows you to call road rescue or repair tow during an emergency, thanks to its nearby located phone. 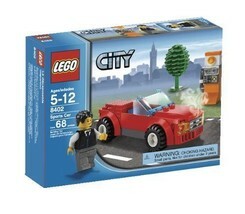 A must have, the Lego 8402 city traffic car assures to improve your city collection.